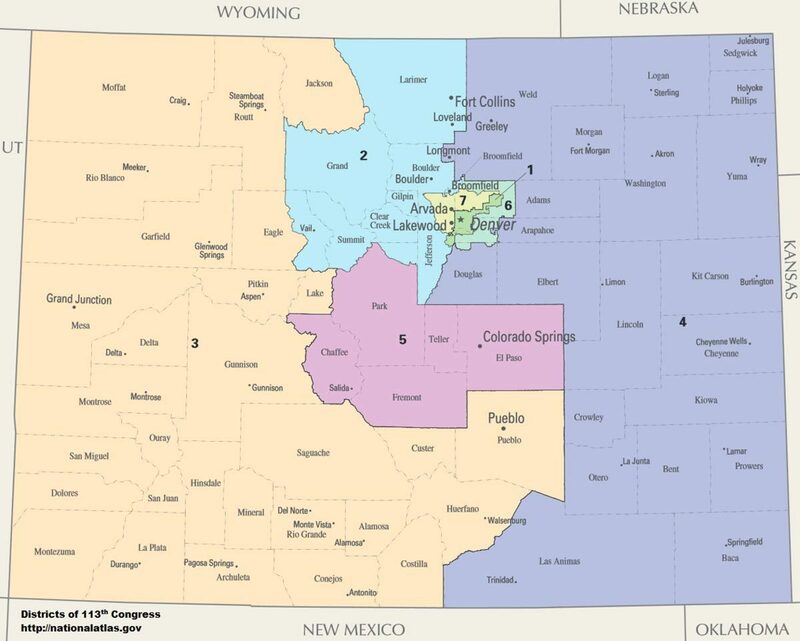 Amendments Y and Z on the Colorado ballot this Fall seek to end gerrymandering by putting Congressional and legislative redistricting processes in the hands of independent commissions. So far, so good. The problem with the measures is that they discriminate against members of minor parties by totally excluding them from the proposed commissions. I noticed the issue when, in late August, I checked out the language of the Senate resolution (18-004) referring Amendment Y to the ballot. The summary language states that, on the proposed twelve-person commission, “one-third of commissioners will not be affiliated with any political party, one-third of the commissioners will be affiliated with the state’s largest political party, and one-third of the commissioners will be affiliated with the state’s second largest political party.” Obviously this leaves out minor parties. Red flag for D.K. Williams [a Libertarian activist], the Libertarian Party of Colorado, and the Green Party of Colorado. By my reading of Amendment Y on Colorado’s ballot, people affiliated with minor parties are totally excluded from participating in the proposed redistricting commission. The language says that the 12-person commission will consist of 4 Republicans, 4 Democrats, and 4 people who “will not be affiliated with any political party.” Am I missing something here? (I’m looking at the first-page summary and have not waded into the 23 pages of legalese.) It seems to me that this blatantly discriminates against people affiliated with minor-parties. (It also strikes me as a bone-head error; the language easily could have expanded the category to people unaffiliated or affiliated with minor parties.) I’ll have to think about this more and get a more-complete analysis of the measure, but if my initial reading is right it seems the minor-party exclusion is a deal-breaker. An August 28 article by Hutchins reports: “[E]arly drafts of the proposal used language saying four commissioners on the map-approving commissions were required to be non-major party members, leaving the door open to third-party members. But the language that will be on November’s ballot explicitly says members must be unaffiliated with ‘any’ political party.” Hutchins also quotes Wayne Harlos of the Libertarian Party of Colorado to the effect that minor parties were excluded from the commissions. Hutchins discusses the proposals in earlier articles as well. Although the details apparently were implicit in Hutchins’s reporting, I am, to my knowledge, the first person to publicly raise the concern that the measures exclude members of minor parties. A September 20 article by Joey Bunch for Colorado Politics mentions that Douglas Bruce came out against Y and Z, partly because their commissions exclude members of minor parties. Bunch does not mention my public comments, Hutchins’s reporting, or the Reason article about the matter. I spent most of last week working up an opinion column for the Colorado Sun about Y and Z; I expect it out on Sunday. My thesis is that the measures wrongly discriminate against members of minor parties. I had far too much material to fit into the column, so I decided to publish some of my findings here. In a Gazette house editorial, Wayne Laugesen came out for Y and Z on June 20. [September 25 Update: Laugesen informs me that he does not necessarily agree with house editorials that he writes, so I’m not sure of his views here.] He mentioned that Colorado Governor John Hickenlooper (a Democrat) supports the measures, as do various other political leaders from both major parties. Laugesen also notes that Kent Thiry, Joe Zimlich, and Heidi Ganahl played major roles in developing the measures. Although Laugesen mentions that the proposed commissions would be composed of members of major parties and unaffiliated voters, he does not explicitly mention the implication that members of minor parties are excluded from the commissions. Neither does an August 17 article (picked up from Joey bunch of Colorado Politics) nor a September 23 article. An August 13 article by Bunch mentions that both major-party state chairs endorse Y and Z. In a house editorial by Kevin Duggan, the Fort Collins Coloradoan endorsed Y and Z on August 31. The editorial does not explicitly mention that members of minor parties are excluded from the commissions. Neither does an August 28 news article published by the Coloradoan. The Denver Post endorsed Y and Z on September 14. The editorial reviews, “Former Republican Speaker of the House Frank McNulty; Amanda Gonzalez with Common Cause Colorado; Josh Penry, a former Republican lawmaker and current conservative strategist; and Mark Grueskin, an elections attorney frequently representing Democrats, all had a hand in crafting this compromise.” The editorial does not explicitly mention that members of minor parties are excluded from the commissions. A September 16 column by Mario Nicolais for the Colorado Sun incorrectly states, “The new commissions will have 12 members filled by random draw among any qualified Coloradan submitting an application to serve.” Otherwise Nicolais offers some good background. I do not claim that my list is comprehensive. Fair Maps Colorado is the major group promoting Y and Z. I contacted (or attempted to contact) every person whom I know to be affiliated with the effort the pass the measures. My understanding from Corey Hutchins’s reporting is that the measures originally allowed members of minor parties to participate in the redistricting commissions. The final language, however, excludes members of minor parties. Was the exclusion intentional? Why were members of minor parties excluded? My concern is that, by excluding members of minor parties in this way, the measures run afoul of the principle of equal protection under the laws. Are you worried about that? Do you think the matter might end up in federal court? Let’s say, hypothetically, that the measures pass this Fall. Might your organization consider running a 2020 corrective measure to allow participation in the committees by members of minor parties? Let’s say, hypothetically, that the measures fail this Fall. Might your organization run the measures again in 2020, in time for 2021 redistricting, modified to allow for the tighter schedule AND to allow participation by members of minor parties? How come there’s a goal to achieve competitive districts? Doesn’t that goal directly conflict with the goal of keeping together like-communities? What’s the added advantage, as you see it, of working toward competitive districts? I know you and Josh plan on connecting at some point to discuss further so I’m including him here, but here are a few items on participation and transparency with Amendments Y and Z. Our measures were crafted giving careful consideration to the overall makeup of the electorate, which is more than 3 million Coloradans. In trying to balance commission membership, we came up with a system that was fair to the largest possible number of voters without giving outsized influence to any one group. Third parties account for about 1.5% of [or “fewer than 60,000”] active voters in Colorado, so the commission membership covers more than 98% of voters. “Participation” is not limited to commission membership. Amendments Y & Z significantly expand the role for any member of the public to participate. Members of the public may also present proposed redistricting maps and written comments for the commissions’ considerations. All hearings will be broadcast online and the commissions must maintain a website where CO residents can submit maps or written comments – ALL comments must be published on the website. After hearings, staff must prepare additional maps for consideration. So essentially, any Colorado voter is welcome and able to participate at any point in the process or propose their own map ideas. Because all comments will have to be published, and all commission hearing will be in public, there is unprecedented transparency in the process. I appreciate Roberts’s reply. However, the fact that Y and Z do not discriminate against members of minor parties in every conceivable way does not alter the fact that they do discriminate against them in an important way. Mr. Armstrong, Mark Grueskin has forwarded your enquiry regarding Minor Parties and Amendments Y & Z to me for a response. The Colorado Supreme Court has already spoken on the issues you raise. Minor parties do not have to be treated as if they were major parties, although minor parties, as with all citizens, will have unprecedented ability to shape the final maps because of the unprecedented public hearing and engagement processes. Given the high level of involvement afforded to unaffiliated voters by these measures and the right of every minor party member to propose redistricting maps and make comments to the Commissions, we are highly confident that the Court, if asked, would uphold both Amendments Y and Z. Thank you for your thoughtful review of Y and Z. Would you do me a favor and mention the particular legal cases you have in mind? What we’re talking about in this case is not the state treating minor parties as entities differently under the law, but about the state purposely excluding all individual members of all minor parties from an important political process, for no good reason. Anyway, it is largely irrelevant what the Colorado Supreme Court says, if federal courts say that the measures violate the federal Constitution. Would you mind replying in more detail on those matters? I will update this post if and when I hear back. I am writing up a column for the Colorado Sun about Colorado’s Amendments Y&Z, the anti-gerrymandering measures. I see you are affiliated with the Princeton Gerrymandering Project, so I hope that you might be able to answer a question for me, or perhaps point me in a fruitful direction. The measures seek to keep like-communities together, which makes sense, but they also seek as a secondary goal to create “competitive” districts. So my basic question is, aren’t those basically incompatible goals, or is it a sensible combination? Historically, has gerrymandering generally resulted in more “competitive” or less “competitive” districts, or is it a mix? I have a general idea of how gerrymandering works, but I don’t know the fine details of how particular regions were split up to partisan advantage. Incidentally, I quite like the overall aims of Y&Z, but I’m also concerned that Y&Z exclude members of minor parties from participating in the relevant commissions. I run the Princeton Gerrymandering Project. You asked my colleagues good questions. I’ve read the Amendments Y and Z language—both voter guide and the amendment text. Overall I like the text a lot. I thought I’d jump in with brief reactions. The key idea here is that gerrymandering is defined as an offense that reduces competition within individual districts. Furthermore, those individual districts can form patterns that hurt a whole party. You make a good point about keeping like-communities together. Doing this is a balancing act. A bad actor can split a community up so never gets a chance at any seats at all. Or the community can be packed into a single district, where they win, say, with 80% of the vote – but end up only winning one district. For this reason, it’s good that there are commissioners to do the job. Partisan gerrymandering is a fancier and more subtle offense. For example, if one side gets 60% wins and the other side gets 80% wins, then the 80% side is packed to its own disadvantage, because it wins very few seats. You can see examples on our website at gerrymander.princeton.edu. Amendments Y and Z prevent such an occurrence. Some partisanship arises naturally from the patterns of where voters live. The effects of those patterns can be amplified by gerrymandering (it’s actually the point of gerrymandering). It’s good that the amendment gives priority to keeping cities, towns, and counties whole, because it gives less latitude to bad actors. Your point about competitiveness is super-important! The amendment says the commission “shall, to the extent possible, maximize the number of competitive districts.” “To the extent possible” is good because it allows the other factors to be used first. Relating to your point, it is essential to define “competitive” in a rational way. As long as both major parties get similar competitive opportunities, this idea can work. For example, “both sides should have similar opportunities to elect” would be a good rule, and it’s the basis for our “lopsided wins” test (it’s here). My general take is that Amendments Y and Z can succeed, but it’s going to require a good-faith effort by everyone. As of now, the Colorado Secretary of State lists Fair Maps Colorado as having received nearly $2.5 million in contributions. That’s a lot of money for a campaign that, to my knowledge, has no organized opposition. If you get into the funding details, a few contributions stand out. Kent Thiry contributed $600,000, as did Pat Stryker. The National Education Association threw in $200,000. The Colorado Economic Leadership Fund contributed $300,000. The Action Now Initiative contributed $268,000, mostly via “consulting.” MDC Holdings contributed $100,000. I will update this post as more news and commentary becomes available about Amendments Y and Z.
October 8: Douglas Bruce has published a document opposing Y and Z.
October 10: On October 8 I gave a talk at Liberty On the Rocks, Flatirons, that began with my critique of Amendments Y and Z.
October 14: I published a follow-up article arguing that the language of Y and Z is discriminatory in a way that the existing rules or not. October 15: Kevin Lundberg opposes Y and Z on grounds that a special-interest group could game the redistricting commissions by flooding the applicant pool.